Twice weekly pick up and exchange service: Nappies will be coded and allocated to you, you will receive back what you gave for washing, this will ensure we have a weekly stocktake and avoids a stockpile of nappies in your home. 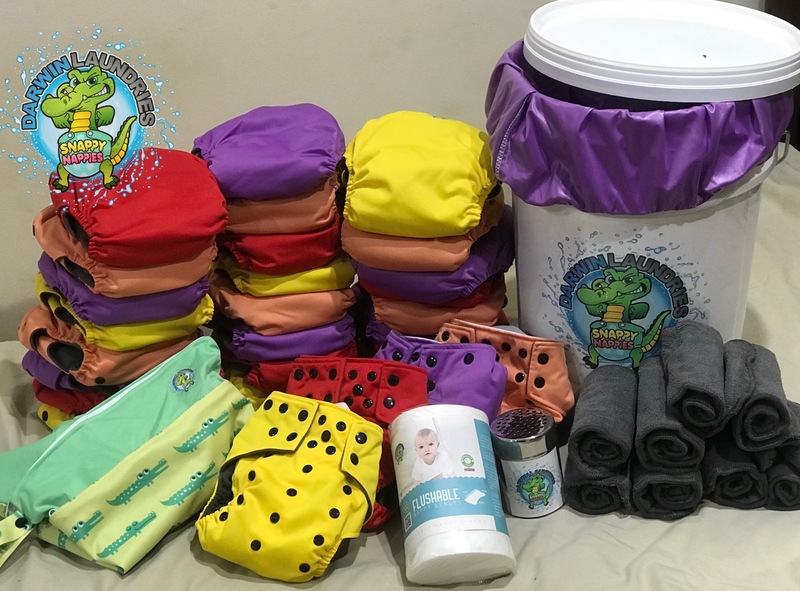 Our Welcome Pack consists of a roll of biodegradable flushable nappy liners, Nappy Bucket, Water proof laundry bag for pick up day and for hygienic storage. Wet bag for when you are out and about and odour neutraliser. All items are the responsibility of the customer & must be returned at the end of the agreement. Supply your own nappies – we wash and sanitize, includes pick up and delivery. Love our products & want to buy for keeps? If you take up Options 1, 2 or 3 (full time, part time or budget packages) and you choose not to extend your service after the introductory rental period has expired, but want to keep some or all of your equipment we have a buy out at second hand price up to a 50% discount. A gift card purchase is one of the best presents you can get a new Mum or someone wanting to try our service or just give a mum a break from washing.